Just started using it have type 2 diabetes and find myself confused on which is better refined or unrefined . What to do I got unrefined is this as good. I think unrefined is good to use, too. It depends on your personal preference and how your body reacts. I have Coconut oil Refined/ Unrefined to cook the frying veggies, put on bread, etc. (not sure which one is properly to use ?) I used to put on my face but apparently my face become pink or my lip become dry before. I did not use it for a quiet long time. The problem is I do not know why many different coconut oil with Expeller or not or not organic or organic, etc. I have a hard time but I got both. I have to pay attention again to see if you would help me better to understand just simple charts with list and break down which best use for face, lip, frying, banana bread, mouth oil pulling from time to time or must daily or what? (I do not have time for daily perhaps on Sundays, hair(forget this because I got really grease hair. Is putting on hair is good for everyone or depends on what kind of hair? )I think we, the people still confused. I think best to have the list of food, etc on the charts with Refined and Unrefined that would help us to understand better what we can use and can not use. Are various coconut oil good or best to use organic than unorganic, etc. What do you think? Thanks. I think organic is always the best choice if you can get it. As far as virgin or expeller-pressed, that’s more of a matte of personal taste than anything else in my opinion. I would only get expeller-pressed refined oil (not the refined oils that use chemically solvents for refining–it should specify expeller-pressed). Otherwise, either one is fine for hair, face, or cooking–it just depends on whether you enjoy the coconut smell/taste (if you do, using the virgin oil is fine). Ha Ha. The thing that really got my attention, was the sentence that contained: “I don’t want coconut flavor invading my scrambled eggs.”. The only reason I find this funny, is because, I am NOT an egg person, and the only way I’ll eat them, is if I use the virgin oil. 😛 Just had to share! Ha! That’s funny. In that case, whatever floats your boat (or eggs)! 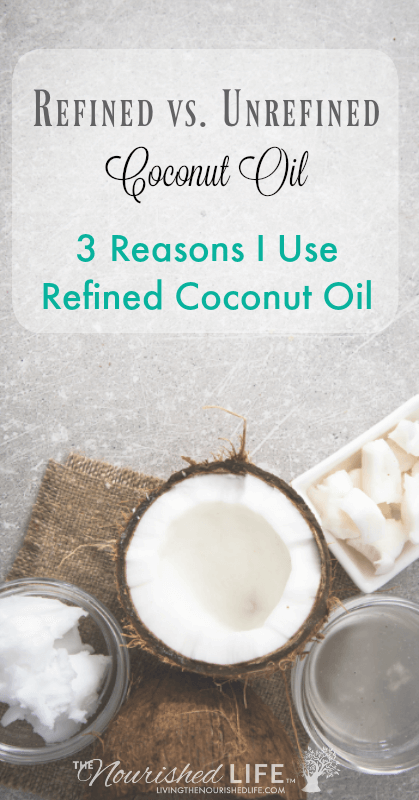 Can we use refined coconut oil for oil pulling? Either one is fine for your hair and skin. which is better to use for skin, refined or unrefined coconut oi? Helena, I’m not sure there’s a huge difference, just whichever you feel works better. Does refined coconut oil have the same antibacterial properties as unrefined in topical applications? As far as I know, yes. It’s the fatty acids that have all the wonderful properties of coconut oil, and the fatty acids are still present in refined coconut oil. Ive been investigating it for use with essential oils in skin salves from what I’ve found If you want to use it mixed with essential oils the virgin has larger molecules that interfere with the skin’s absorption of the essential oils while the refined has smaller molecules which works better for blending and absorbing into skin. you don’t see too much on this subject even though more people are using it as a carrier oil but it does seem it makes a difference there but then does that also make a difference when just using it by itself. Thank you for this. 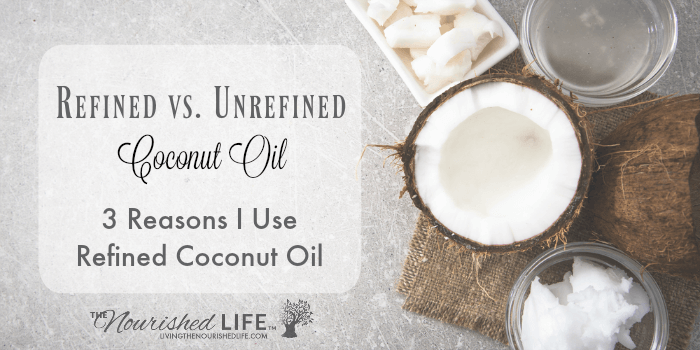 I was doing some research on what to pick up as far as coconut oil goes and having never used it before I had no idea, that the unrefined was not going to be a neutral flavor. Was expecting it to be similar to grape seed oil. My food doesn’t taste like grapes when I cook with it, and had assumed the same was true for coconut oil. Thanks for pointing out the difference between refined and unrefined. VERY helpful! Can I used naturally refined coconut oil for my lips? I had no idea. I would love the option of coconut oil that doesn’t taste so coconutty. Thanks for that. You’re welcome! I love coconut, just not all. the. time. I agree, I do not use unrefined coconut oil very often because I just don’t care for the taste of it in combination with other foods. I use refined coconut oil for everything and consume more of it because there is no taste. Coconut-flavoured eggs just isn’t my thing!! Bleh!! i was eating unrefined and was getting stomach aches. I just bought some refined organic coconut oil today and have been eating it, and I feel fine. I looked it up online and found this article. Good to find this. Thanks. Thanks so much for this very informative and helpful article.